On Wednesday, Road & Bridge Construction Crew Member Thomas Hillard received a plaque for completing the Roads Scholar Program from the Colorado Local Technical Assistance Program (CLTAP). 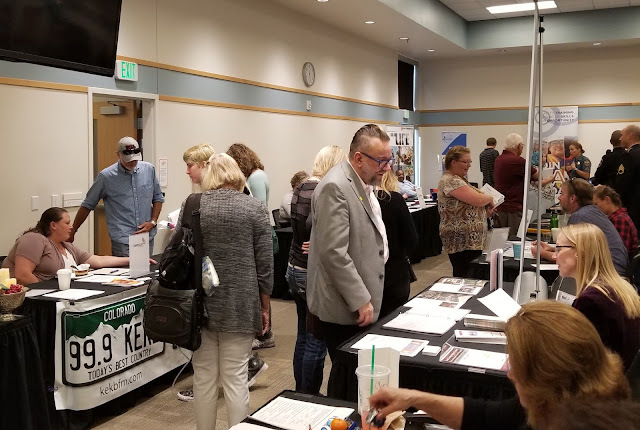 This included training on drainage, safety on the job, signing/pavement markings, Manual on Uniform Traffic Control Devices (MUTCD), and roadway safety & work zone traffic control. Last Friday (Sept. 29), Great Outdoors Colorado (GOCO) held a press conference at the Lunch Loop trailhead parking lot to announce their $1.5 million grant award to the City of Grand Junction to construct the remaining 1.5-mile of paved and shared use path to the Lunch Loops/Three Sister trails. 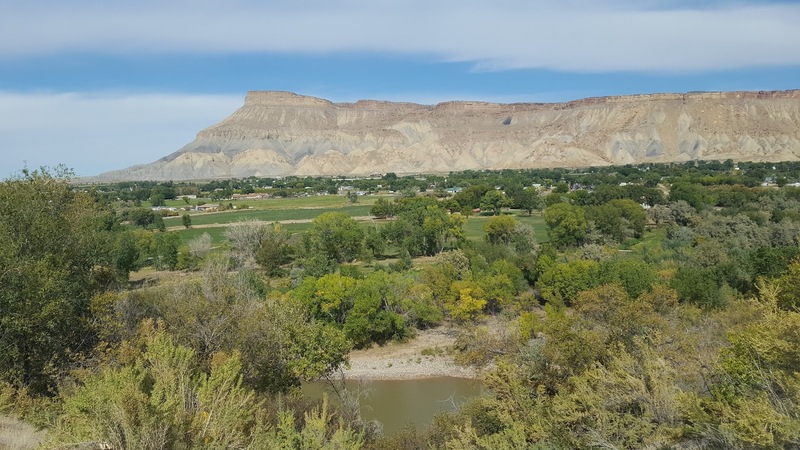 The award was part of collaborative efforts by the Bureau of Land Management, City of Grand Junction, Mesa County, Mesa Land Trust, One River, and the National Park Service to create multi-use trails that connect across the Grand Valley. 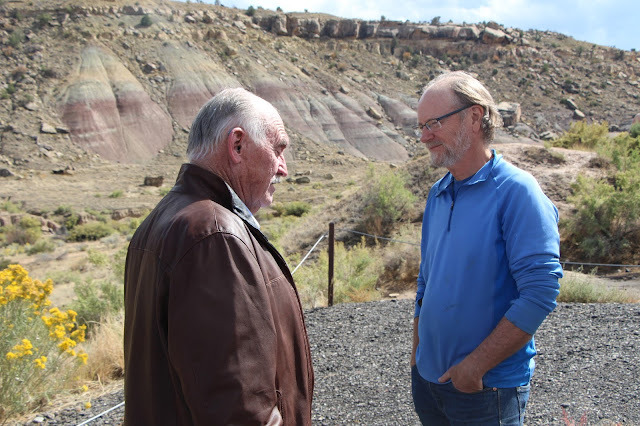 Commissioner John Justman attends GOCO's press conference to hear about the project to improve transportation and recreational trail access through the path connecting the Colorado Riverfront Trail to the Monument corridor.The project is expected to be completed by June 2019. The grant that will be used to complete the link between the riverfront to the monument via the Lunch Loop/Three Sister trails as part of a statewide project called the Connect Initiative. Mesa County Natural Resource Liaison Keith Fife, right, arrives at the press conference on his bike. Commissioner Justman tells him he left his bike at home. Mesa County Engineering Division Director Scott Mai briefs Commissioner Justman on the details of the project. A constituent shares his priorities and opinions with Commissioner Justman after the press conference concluded. Mesa County Noxious Weed and Pest Management scramble up and down the cliffs behind East Orchard Mesa looking for ornamental noxious weed Chinese clematis. Alan Barbee with Noxious Weed and Pest Management cuts a makeshift trail on loose shale down a steep cliff above the Colorado River in Palisade. This is a lot more difficult than it looks! 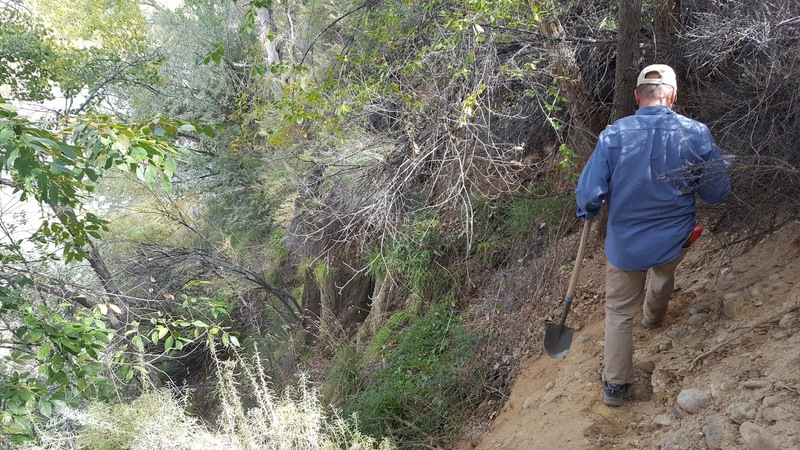 The Noxious Weed and Pest Management crew scoot and slide down the cliff to search for and access the Chinese clematis vine. 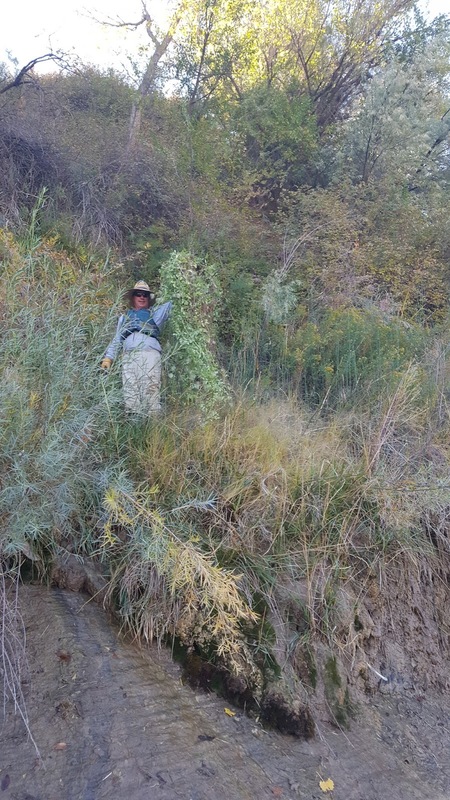 Chinese clematis is a rare noxious weed in Mesa County. It is an escaped ornamental with pretty yellow flowers and unique puffy seeds. 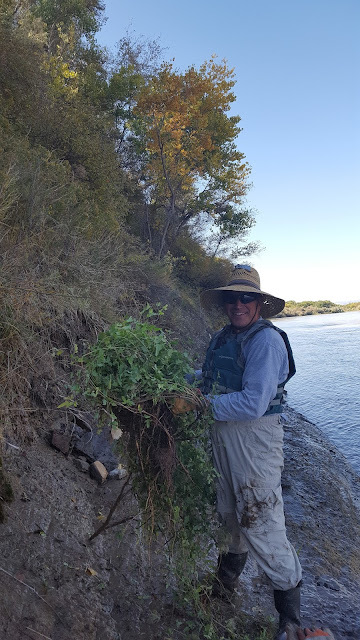 Alan Barbee with Noxious Weed and Pest Management displays the large Chinese clematis vines that he and the crew were able to locate and pull from the steep shale cliffs in Palisade. Chinese clematis is a rare noxious weed in Mesa County, it most likely escaped from an ornamental planting in a flower bed somewhere on East Orchard Mesa and planted itself here on the cliff. Chinese clematis can be confused with a very common native clematis that can be found along the river and highways and has small white flowers in the summer. 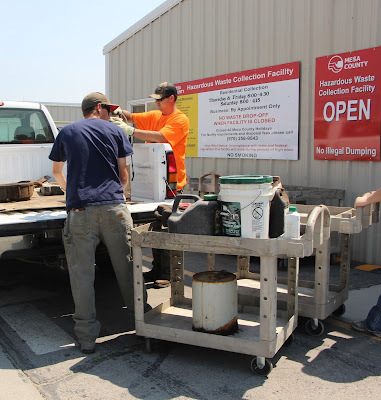 Mesa County Hazardous Waste Collection Facility makes it easy to drop off your unwanted hazardous waste, and it's free. The facility, located at 3071 Highway 50, is the first building on the left as you enter the Mesa County Solid Waste campus. Stop by Thursdays or Fridays, at any time between 8 a.m. and 4:30 p.m. or on Saturdays from 8:00 a.m. to 4:15 p.m. Hazardous waste includes cleaning products, automotive cleaners, garden chemicals, aerosol cans, antifreeze, old gasoline, paints, motor oil and more. You may also find something you need on their shelves to take for free! 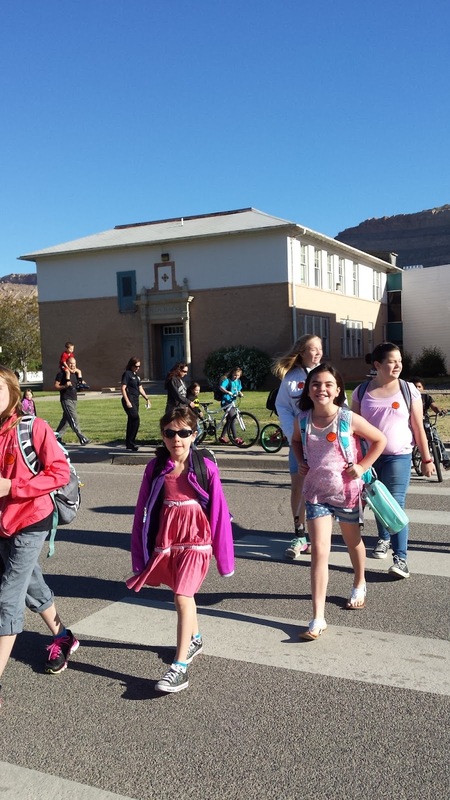 October is Walk and Wheel to School Month in Mesa County. 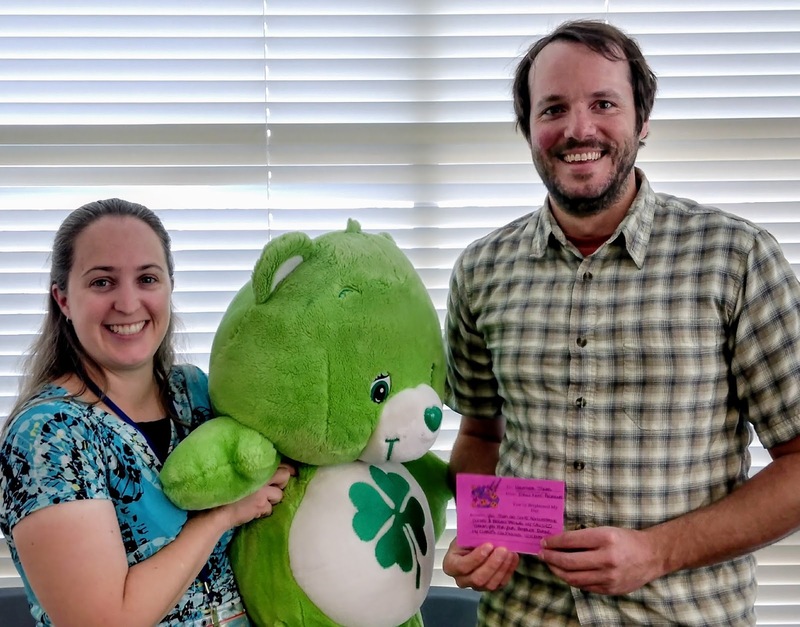 School communities are celebrating by coordinating walking school buses (a walking school bus is a group of children walking to school with one or more adults) for neighborhoods, meeting at a central location and walking and wheeling together to school, and holding prize drawings for participants. You can also celebrate by walking or biking with your children to school. If you live too far to walk or bike the whole way, consider parking a half-mile away and walking the rest. 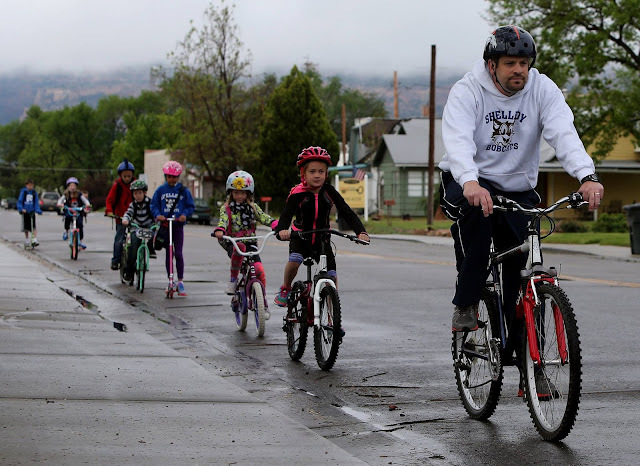 Safe behavior helps to create safe roads in Mesa County. Drivers: give pedestrians and bicyclists at least three feet of space on the road. Kiddos: walk and ride on the sidewalk if there is one, wear your helmets for riding, obey all rules of the road, and use lights and bright clothing for visibility. 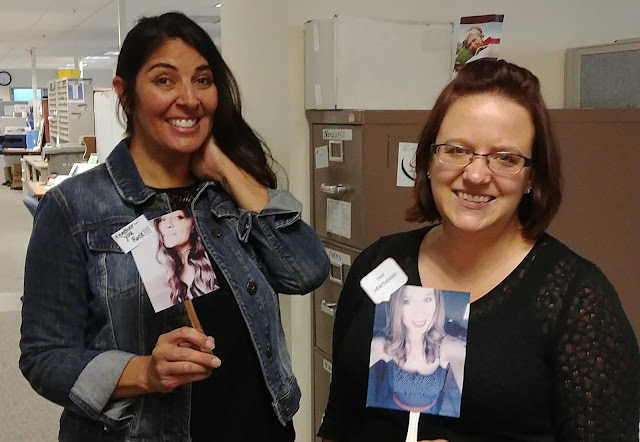 Department of Human Services (DHS) Single Entry Point team members from Adult Services always want to be inclusive Shawna Paletta, left, and Eden Martin, right, found a creative way to include staff members who were out of the office to participate in the You Brighten My Day presentation. September's You Brighten My Day winner is Heather Jones. Congratulations! Adult Services Director Grant Jackson presents the recognition. On Thursday, the Mesa County Workforce Center (WFC) held a JobFest Job Fair. Fifty-five different employers and nine resource booths were at the event. According to WFC Director Curtis Englehart, "Our job orders are up over 30 percent from this time last year. Full-time permanent job orders are up over 60 percent from this time last year. 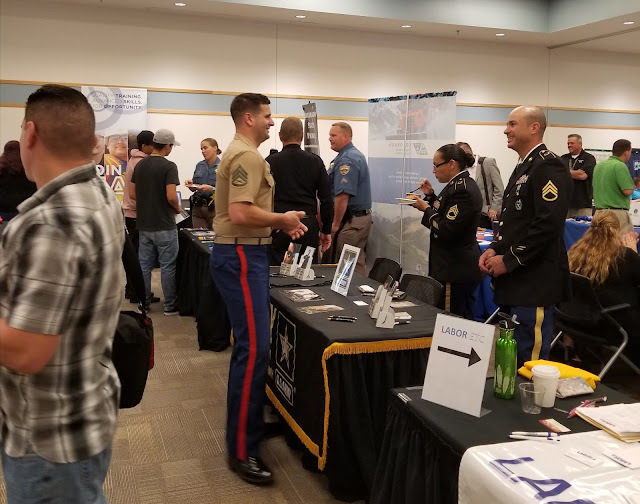 This is the lowest unemployment rate we have seen in ten years at 3 percent and job orders up, now is a great time for our job seekers to obtain the career they have been wanting." 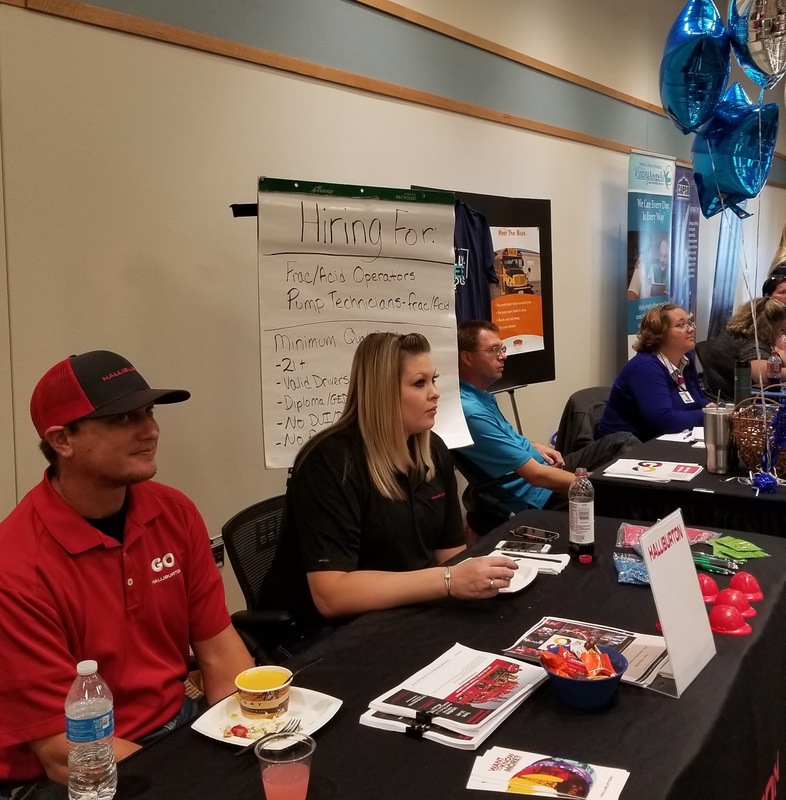 Halliburton human resources recruiters talk to potential employees ar the JobFest at the Workforce Center, 529 29 1/2 Road. Hundreds of people looking for career opportunities attended the Workforce Center's JobFest. Progress continues at the Animal Services facility, this week a freezer is being installed. The mechanical room at Animal Services facility got a few water heaters installed this week. Water-resistant wall panels are in the process of being installed in the Animal Service's laundry room. Water-resistant wall panels go up in the food preparation area at the Animal Services facility. Preparation for door installation and epoxy floor in dog quarantine room just got underway. Spring is a distant memory, and the long summer days have come to pass, as you tidy and button up your home for winter. You’ve cleaned your house and garden over the last few months, and now it’s time to get rid of cleaning products or garden chemicals (hazardous household waste) that you won’t use anymore. Mesa County Hazardous Waste Collection Facility makes it easy to drop off your unwanted hazardous waste, and it's free. 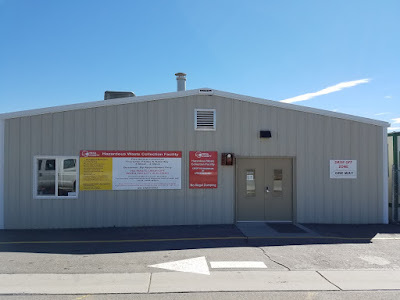 The facility, located at 3071 Highway 50, is the first building on the left as you enter the Mesa County Solid Waste campus. Stop by Thursdays or Fridays, at any time between 8 a.m. and 4:30 p.m. or on Saturdays from 8:00 a.m. to 4:15 p.m. Hazardous waste includes cleaning products, automotive cleaners, garden chemicals, aerosol cans, antifreeze, old gasoline, paints, motor oil and more. Proper disposal helps prevent accidental poisonings and fire hazards in the home. Mesa County Hazardous Waste Collection Facility, at 3071 Highway 50, makes it easy to drop off your unwanted household hazardous waste. It's easy to drop off your unwanted household hazardous waste at the Mesa County Hazardous Waste Collection Facility. But wait, there is more! Not only can you drop off your unwanted hazardous waste— you may find something you need on their shelves to take! Find something you need, take it for free! Proper disposal helps prevent the potential of accidental poisonings and fire hazards in the home. 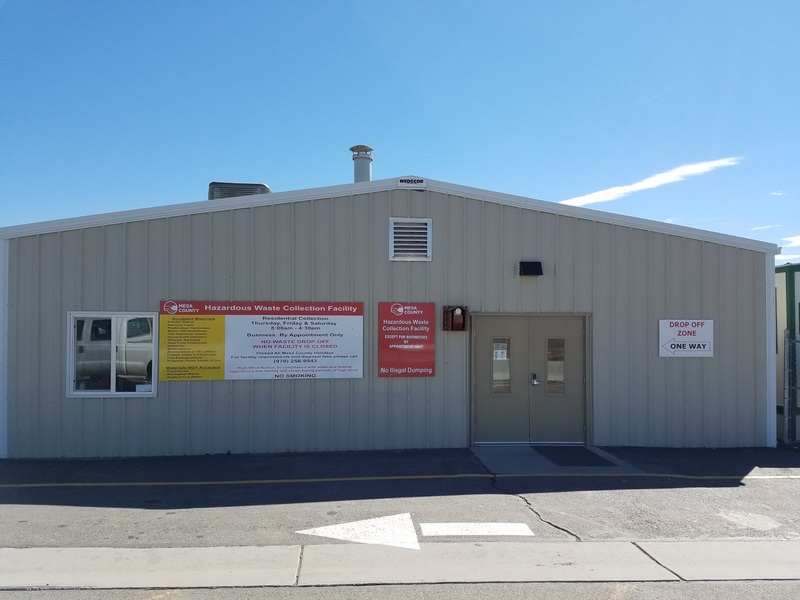 Mesa County Hazardous Waste Collection Facility is open to residents to pick-up or drop-off household cleaners, paint, car wax, antifreeze, fertilizer, garden chemicals, etc. Reuse of these items promotes environmental stewardship by reducing the amount of disposed waste. It’s a great way to save money and help decrease our impact on the environment. 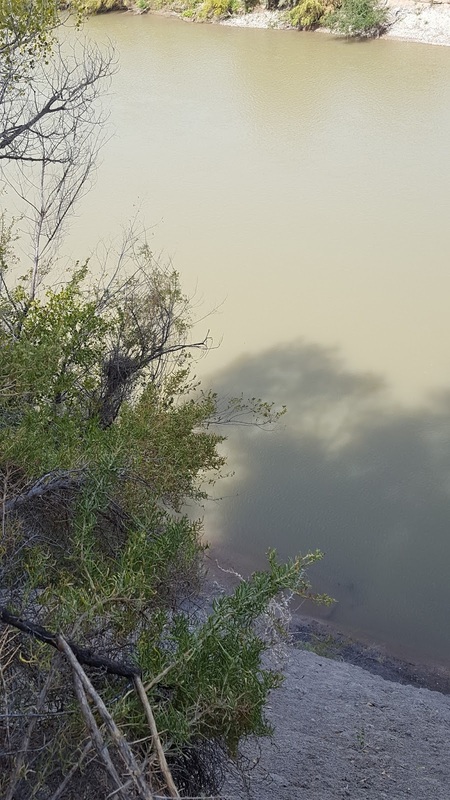 In 2016, the Hazardous Waste Collection Facility collected 176,368 pounds of hazardous waste and shipped it off through a hazardous waste vendor. Also, 284,614 pounds of e-waste was recycled through an electronic waste vendor, and 110,160 pounds of used oil/antifreeze were recycled. That is a total of 571,124 pounds of hazardous waste collected in Mesa County. Approximately 9,093 residents were served last year.